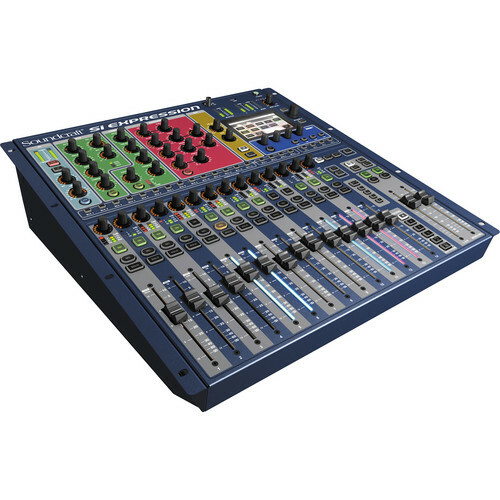 The Soundcraft Si Expression 1 Digital Mixer is a digital mixing console designed for live sound applications. The mixer features 16 microphone preamps, 4 line inputs, AES in, 4 internal stereo FX returns, 14 faders, a 64 x 64 expansion slot for additional routing possibilities, and 66 input processing channels. Every input processing channel on the board can be routed through a dedicated high-pass filter, input delay, compressor, gate, and four-band equalizer. Each channel is also under the control of an automation system with four mute groups and illuminated faders to keep track of signal processing. For outputs, the mixer includes 16 balanced line outputs, a headphone monitor output, AES output, and the 64 x 64 expansion slot. The mixer features 14 aux/group mixes that can be used as 14 mono mixes, or 8 mono and 6 stereo mixes, or any combination between. The mixer also utilizes 4 matrix mixes that allow you to assign any combination of inputs to any combination of outputs in either mono or stereo mode. In addition to the auxiliary/group and matrix busses, the unit features four mix busses dedicated to the device's internal Lexicon FX processing. Each bus mix includes a delay, compressor, a four-band equalizer, and a BSS graphic equalizer. Since the Lexicon FX processor is hardware based, using the effects does not influence the signal processing performance of the rest of the mixer. For I/O expansion, the mixer will accept any of the Soundcraft Si series option cards including AES, AVIOM, CobraNet, Firewire/USB/ADAT, Dante CAT5, and optical MADI. The MADI card allows you to connect to multi-track recording systems, plug-ins such as WAVES, and Studer or Soundcraft stageboxes. Using a stagebox increases both the number of physical inputs, as well as the number of input processing channels. Every processing parameter utilizes a dedicated control so that you do not need to navigate through menu hierarchies to make adjustments. A row of global mode encoders above each channel gives you control over gain, high-pass filter parameters, and pan position. Box Dimensions (LxWxH) 28.0 x 22.0 x 10.0"
Si Expression 1 Digital Mixer is rated 5.0 out of 5 by 1. Rated 5 out of 5 by Stacy DOOSE from Impressive I've used this console for six months doing mix for TV, video, webcasting and sound reinforcement. Versatile and surprisingly quiet. mosimpressed with the microphone preamps. impressed with the mic preamp.